The potato P locus is required for the production of blue/purple anthocyanin pigments in any tissue of the potato plant such as tubers, flowers, or stems. We have previously reported, based on RFLP mapping in tomato, that the gene coding for the anthocyanin biosynthetic enzyme flavonoid 3′,5′-hydroxylase (f3′5′h) maps to the same region of the tomato genome as P maps in potato. To further evaluate this association a Petunia f3′5′h gene was used to screen a potato cDNA library prepared from purple-colored flowers and stems. Six positively hybridizing cDNA clones were sequenced and all appeared to be derived from a single gene that shares 85% sequence identity at the amino acid level with Petunia f3′5′h. 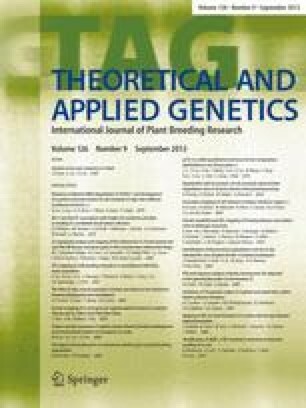 The potato gene cosegregated with purple tuber color in a diploid F1 sub-population of 37 purple and 25 red individuals and was found to be expressed in tuber skin only in the presence of the anthocyanin regulatory locus I. A potato f3′5′h cDNA clone was placed under the control of a doubled CaMV 35S promoter and introduced into the red-skinned cultivar ‘Désirée’. Tuber and stem tissues that are colored red in Désirée were purple in nine of 17 independently transformed lines. We thank J. Van Eck for the transformation protocol, K. Paddock and M. Compton for maintenance of field and greenhouse plants, K. Loeffler for photography, and H. De Jong for reviewing the manuscript. This work was supported in part by Federal Hatch funds provided to W.D.